Jeff is PROS's Sr./ Lead Investigator and advisor to all directors and members. 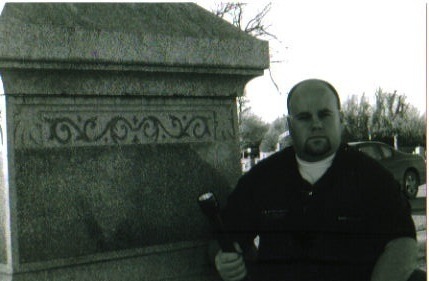 Jeff has had a life-long interest in the paranormal even though he had never experienced any events that would be considered such prior to his time with PROS. He is level-headed and likes to think things out before delivering an opinion. Jeff enjoys investigating, recording, and analyzing paranormal events as they occur, and he feels especially fortunate and honored to investigate historic Oklahoma sites in a long-term research capacity. He enjoys helping anyone who needs investigative help whether it is confirming activity or finding a plausible explanation for events that may have been considered paranormal. His area of expertise is his ability to sense the environment of a place and finds that ability more to his advantage and that of the team's than any equipment thus far. He may one day want to start a team in the El Reno area where he and his family live. He is married, and his wife's name is Katie, they have three children. His background is in music and when he's not out with PROS investigating, he enjoys spending time with his family and indulging his wide musical interests. Judy holds a degree in Psychology and has participated in our research at our site. She has had some paranormal experiences of her own. She has a desire to learn and conduct research and investigations with PROS. Judy plans to help by learning to review EVP and other data the team collects during investigations. Judy also holds a certification in Parapsychology. Judy is leading the PROS all women team and preparing them for investigations. Karen holds a Bachelors of Science Degree in Education, with areas of concentration in Math and Science. She also holds a certification in Parapsychology. She plans to use her education to help enhance PROS operational abilities, and is the Training Coordinator for the PROS Team. She also works in the EVP field as well as overseeing PROS Parapsychology research and experiments. Karen has had experiences in her life that could be considered paranormal in nature. Karen also enjoys spending time with her children, grandchildren. Rev Jack Is a member for the team. Jack has had a life long interest in the paranormal since childhood. Jack joined PROS hoping to experience the paranormal for himself and find some answers to the many questions he has. Jack is a real blessing to all of us! Jack also has a certification in Parapsychology. Jack is the clergy for the team and has in the past preformed blessings in homes and places for those in need of spiritual help and advise.